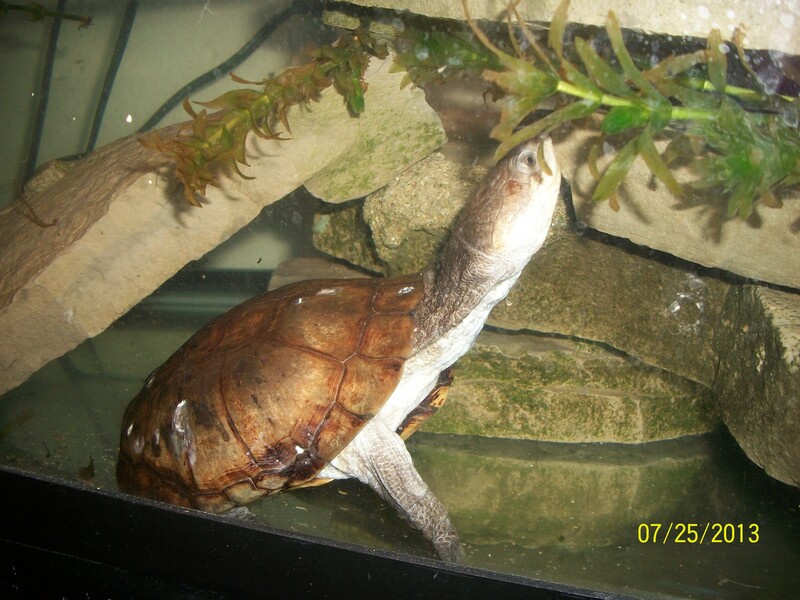 African Sideneck Turtles are freshwater turtles. They were originally discovered in Eastern and Southern Africa. Fortunately, these turtles are not listed on the endangered species list, so acquiring one should not be too difficult. These reptiles are most active during the day time and have a lifespan of 25+ years! The shell of an African Sideneck Turtle can grow anywhere from eight to upwards of eighteen inches. So, this species is on the larger end of the spectrum for pet turtles. Contrary, to popular belief not all turtles can fully withdraw their heads into their shells; the African Sideneck Turtle is an example of this and they simply turn their heads to the side and fold them under the upper edge of their shell; hence their name. This species of turtle is normally the typical earth tones, that one may associate with them. Their colors vary from dark brown and tan to gray and black. The turtles that are dark brown and tan are more difficult to find. When considering getting the African Sideneck Turtle for a pet, it is important to take into account the nature of the reptile. They are said to be hardy and curious by many and some say they are somewhat aggressive until they have settled into captivity. The majority do not prescribe to that description; so, do not let that hinder you if you are set on getting one of these reptilian creatures, just be prepared to meet your turtle with patience and understanding if they do exhibit this behavior. On a more positive note, African Sideneck Turtles are fairly low maintenance. They are simple creatures and require no more than a simple enclosure, such as a large aquarium, some gravel, and a few decorative items such as driftwood to bask upon. These turtles love to swim and bask so an owner must ensure the turtles are able to do these activities in order to have a happy pet. The African Sideneck Turtles will consume commercial grade turtle food, but will still eat the foods that they are found eating in the wild if provided the opportunity. They also eat dark leafy greens and an assortment of freeze and sun dried treats. If kept properly, African Sideneck Turtles should not have many ailments or problems, but following is a few that might arise. Some turtles, may have a damaged shell, these are usually minor and will heal very well with a Betadine® scrub; more major issues may need to be treated with Silvadene® cream or similar treatment for wounds. With both of these treatments, direct exposure to sunlight is highly recommended. Nematode parasites are often found in newly imported turtles, so if you are considering obtaining a turtle that has recently been imported, it should be given dewormer like panacur shortly after getting established in its new habitat. Some African Sideneck Turtles may have minor eye problems upon arrival, but this is usually a symptom of dehydration and perhaps even substandard shipping conditions. Again, sunshine is highly recommended to treat these issues and of course making sure your turtle has plenty of water. These turtles are more than likely used to warm weather and plenty of sunshine, so when exposed to cold weather for longer durations of time, some experience respiratory problems. If you live in a cold climate, a UV﻿﻿﻿ light will help with this issue. Most of these issues are sparse and as you can see, they are fairly easy to alleviate. In the wild, African Sideneck Turtles spend most of their time in the mud of shallow lakes and rivers. In captivity they do best in about eight inches of filtered water. The main predators of the African Sideneck Turtle are carnivorous birds, such as eagles and falcons. Their aquariums should be able to hold 60 to 100 gallons, depending on the expected size, once they reach maturity. They mainly consume invertebrates such as: insects(crickets), meal worms, and worms. Some owners, also keep their pet outside in their garden or in a pond. One thing to be careful of in this type of enclosure, is to make sure that there is no way to escape. There are a multitude of reasons to take precautions that these turtles do not escape back into the wild.